Launched in March 2018 by Dr Convy Baloyi, a “born-again child of God”. 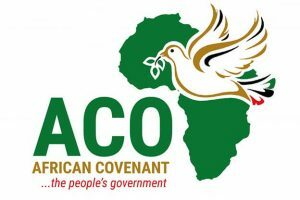 The African Covenant party abbreviates to ACO, pronounced “Ah-Kho”, and is campaigning on conservative religious principles. It wants to preserve marriage as an institution uniting “one man and one woman”, and end abortion. The ACO also proposes the return of the death penalty for crimes including murder (which, in ACO’s view, includes the medical practice of carrying out abortions). The CALLING of African Covenant (ACO) is to deliver a South Africa which is built on pillars of Unity, Respect, Order and Prosperity, through A RIGHTEOUS MANDATE FOR POLITICS, which is based on values of Truth, Love, Selflessness, Service Delivery with integrity and excellence.